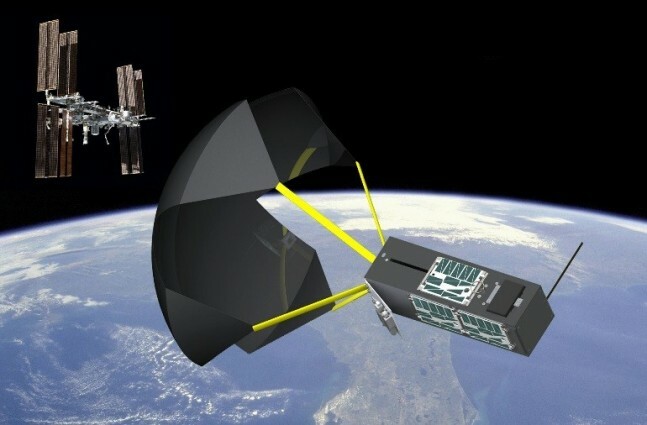 Graphic rendering of TechEdSat–4 with exo-brake deployed. Exo-brake is an aerodynamic specially-designed parachute-like device, that causes the satellite to de–orbit and re–enter Earth's atmosphere. Image and Caption Credit: NASA. On the afternoon on March 3, the International Space Station deployed a small satellite using its Nanoracks CubeSat Deployer, the first NASA satellite to be thus ejected. TechEdSat-4, as the payload is named, is designed to test new space brake technologies to facilitate the rapid return of payloads to Earth. The TechEdSat series, a technology education collaboration with San Jose State University and the University of Idaho, uses the standard CubeSat structure, which measures one unit (1U) as approximately four inches cubed (10 centimeters cubed). TechEdSat-4 is a 3U satellite. Image and Caption Credit: NASA. “The exo-brake is a self-stabilizing exospheric deorbiting mechanism that will allow us to return a payload to Earth fairly rapidly from an orbital platform, like the International Space Station,” said Murbach, program manager at Ames Research Center in Moffett Field, California. Two and a half hours after initial launch, the small satellite received a command via email to deploy its exo-brake, which is capable of producing drag in the very low-pressure environment of low-Earth orbit. The satellite’s capacity to receive commands over email is equally significant, part of a suite of communications packages designed to replace the need for ground stations to monitor the health and status of orbiting payloads. TechEdSat-4 is part of a partnership between San Jose State University and the University of Idaho. The satellite, the fourth successful installment, measures 12x4x4 inches (30x10x10 centimeters) and weighs about five pounds. The series has been undergoing orbital tests since 2012 when TechEdSat-1 demonstrated the model’s basic communications capabilities. 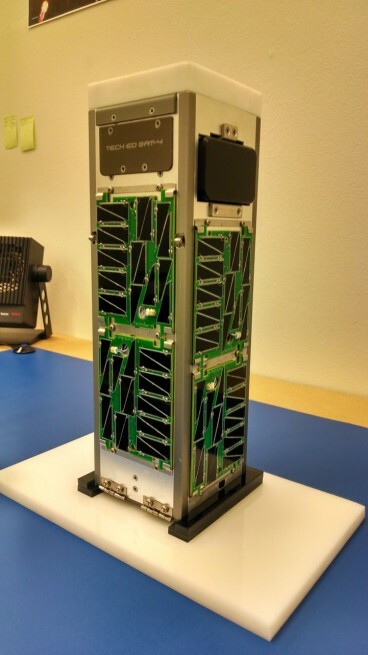 TechEdSat-5 is scheduled for launch later this year. The model will be roughly comparable to the fourth edition but will feature a more maneuverable exo-brake.